Not to be confused with Pyramid Song. 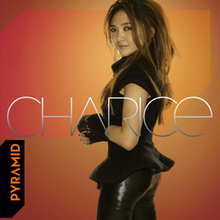 "Pyramid" is the second single by Filipino pop and R&B singer Charice (now Jake Zyrus) and the lead single from his debut album, Charice. The song credited under his pre-gender transition name Charice, features vocals from British Virgin Islands singer Iyaz, was written by David Jassy, Niclas Molinder, Joacim Persson, Johan Alkenäs and R&B singer-songwriter Lyrica Anderson, and produced by Twin and Alke. A remix was to be released on iTunes on February 16, 2010, but was later changed to February 23, the same day as the release of the album version. The album version was itself then delayed and released on March 2. "Pyramid" is a midtempo pop ballad with lyrics that metaphorically describes the strength of a relationship. "Pyramid" peaked at number 56 on the US Billboard Hot 100, making Zyrus the second Filipino singer to enter the chart since Jaya's debut single "If You Leave Me Now" peaked on the Billboard Hot 100 at number 44 in 1990. It reached number one on the Billboard Dance Club Songs chart. "Pyramid" had already received airplay before it was released to iTunes. It aired on 104.3 in Las Vegas before its release as a single. The album version was released to US mainstream radio on March 15, 2010. It is his first single to achieve mainstream airplay. The song was sung in Simlish for The Sims 3: Ambitions, an expansion pack for the strategic life simulation computer game, The Sims 3. A 24-second sample of "Pyramid" featuring vocals from Zyrus and Iyaz during the chorus. Zyrus's first live performance was on The Oprah Winfrey Show with Iyaz on May 11, 2010. He also performed it on QVC with his other songs from his self-titled album, Charice such as "I Love You", "Note to God" and "In This Song". The promotional music video for the track was released on March 2, 2010. The video shows Zyrus and Iyaz in the studio singing and recording the vocals to the song. The official music video for the track was directed by Scott Speer and released on April 12, 2010, premiering on Oprah Winfrey's website. The video was shot at the Orpheum Theatre, in downtown Los Angeles on March 8, 2010. The music video shows Zyrus upset at not being selected for further school auditions. Zyrus steps out on stage and Iyaz films his singing on his camera phone. ^ Macpherson, Alex (January 6, 2010). 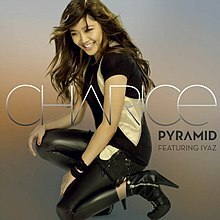 "Charice Pempengco Lyrics: Charice – Pyramid Feat Sean Kingston Lyrics Leaked". neccel.com. Archived from the original on January 12, 2010. Retrieved January 6, 2010. ^ "Jaya Chart History: Billboard Hot 100". Billboard. ^ a b "Charice Chart History (Dance Club Songs)". Billboard. ^ "Australian-charts.com – Charice feat. Iyaz – Pyramid". ARIA Top 50 Singles. ^ "Charice Chart History (Canadian Hot 100)". Billboard. ^ "Charice Chart History (Canada Hot AC)". Billboard. Retrieved August 31, 2018. ^ "The Irish Charts – Search Results – Pyramid". Irish Singles Chart. Retrieved June 18, 2018. ^ "Dutchcharts.nl – Charice feat. Iyaz – Pyramid" (in Dutch). Single Top 100. Retrieved June 17, 2010. ^ "Official Scottish Singles Sales Chart Top 100". Official Charts Company. Retrieved June 18, 2018. ^ "Official Singles Chart Top 100". Official Charts Company. Retrieved August 31, 2018. ^ "Official R&B Singles Chart Top 40". Official Charts Company. Retrieved June 18, 2018. ^ "Charice Chart History (Hot 100)". Billboard. ^ "レコード協会調べ 2009年12月16日～2010年12月14日「着うたフル(R)」 2010年有料音楽配信「年間チャート」（通称：レコ協チャート）" [Record Association Analysis: December 16, 2009 – December 14, 2010 Full-length Cellphone Download 2010 paid digital sales "Yearly Chart" (Abbreviated: RIAJ Chart)] (PDF). RIAJ. December 20, 2010. Retrieved December 22, 2010. ^ "Hot Dance Club Play Songs 2010". Billboard. ^ "Single Certification List - January 2014" (in Japanese). Recording Industry Association of Japan. Retrieved September 6, 2014. "It Can Only Get Better"
This page was last edited on 21 February 2019, at 16:33 (UTC).